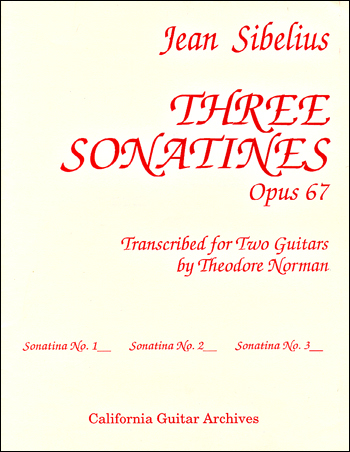 Originally for piano, the transparency of these three Sonatines is ideally suited to guitar duo presentation. Sonatine Nr. 1 uses the whole range of the guitar, from the sixth-string D (scordatura) up to the B on the 19th fret. The two outer movements (Allegro and Allegro moderato) have a two-part texture; the middle Largo features rich seventh and ninth chords, pedal points, and gentle syncopations. As with the other two Sonatines, this beautiful composition serves as a musically satisfying way to explore the upper register of the guitar. Sonatine Nr. 1 is an intermediate level duet in three movements using traditional tuning. The Elgart/Yates LP Music of the 20th Century includes Sonatine Nr. 3; Glenn Gould recorded all three Sonatines for CBS.